We are about to launch a journey that we feel confident stating is unlike one that has ever been seen before in Mormon literature. Over the next two weeks, we will publish twelve LDS-themed short stories, essays, and poems—set all over the world and written by authors living around the world. These finalists will be published in six languages (as well as with English translations). Last year, when we started our planning process, we were a little nervous about whether we’d be able to reach writers around the world on our first attempt. It seems, though, that many Latter-day Saints have been hoping for a chance to share stories and only been waiting to learn where they could find it. 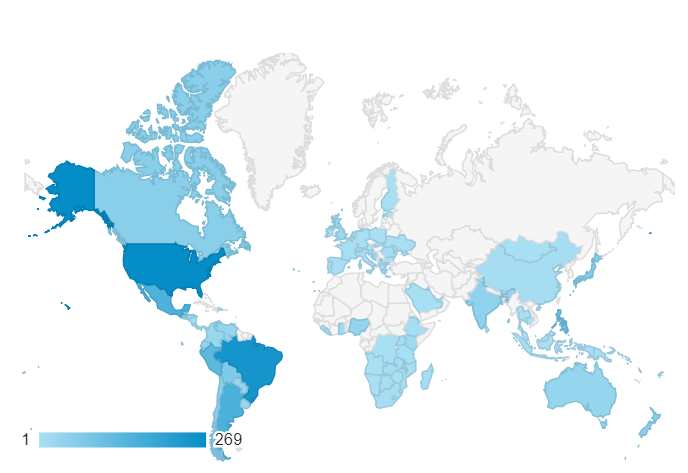 From when we announced the contest in August until the contest deadline, December 31st, we had people visit our website to read about the contest from ninety-three countries around the world. This was made possible through a combination of word of mouth and a worldwide Facebook advertising campaign. In the end, writers from twenty-two different countries submitted almost one hundred entries. Our greatest number of entries came from Argentina, followed closely by Mexico; other entries hailed from Cape Verde, Ghana, Moldova, Papau New Guinea, India, and others. We had people enter the contest from each (inhabited) continent/region of the world—North America, South America, Africa, Europe, Asia, and Oceania—and over the next two weeks we are publishing stories representative of each of these regions. This contest grew out of desire—from both readers and writers of our previous contests—to experience stories from Latter-day Saints all over the world. Of the sixteen million members of the church, only six million live in the United States, and yet a large majority of our past contest entrants were from the United States. Our goal of this contest was to find and publish amazing storytellers whose voices, and even languages, might be new to our readers. In doing so, we think we are taking steps to follow the Savior’s directive, which He gave time and time again, to “be one”—“one fold” with “one shepherd.” We are expected, as members of the Church of Jesus Christ of Latter-day Saints to have unity. And unity is something you have to reach for. But what does this unity look like in Mormon Literature? The first step in building greater unity in literature is simply sharing an imaginative space. Unity does not mean, however, that we should simplify or erase our differences to put on a single face. We are not attempting to choose one representative story for all of us. We can only be one if we listen to and celebrate all of our stories, stories that grow from different places, cultures, struggles, and strengths. We look across the campfire, we sit quietly, and we listen. Sometimes the stories will be told in ways that are familiar to us; other stories will use different storytelling traditions that diverge from our own. One of Jules Verne’s most celebrated books is Around the World in Eighty Days. In order to win a wager, the main character, Phineas Fogg, attempts to circumnavigate the entire world in eighty days. So intent is he in trying to achieve his goal that often he does not even look outside the window to experience the world as he travels around it. Sometimes we do the same as church members and readers—we travel, to be sure, but may not take the effort to look out the window, or else look too shallowly, too briefly, without allowing ourselves to be impacted by what is on the other side. I’ve often heard Latter-day Saints come back after time outside their native countries and exclaim, “You can feel the Spirit at church anywhere in the world!” I have personally attended LDS churches in Brazil, Finland, Iceland, Germany, Egypt, and the United States, and it is true that I felt the Spirit of God in each place. And yet I also saw God through what was distinct in each place. In each place I had markedly different experiences that went beyond whether the church building had a basketball court or a fútbol field, or whether people in that place are baptized in a font, a river, or a hot tub. In different places I was able to learn different things about myself, my Savior, and my relationship to Him. Perhaps we only truly come to unity in the faith by honoring what is unique in each manifestation of faith. The second approach is to write out of your own experience. This, at its core, is the task of the nonfiction writer. It also applies, in this contest, to fiction writers telling fictional stories which represent their own place and time, drawing more directly on their own experience. In the next two weeks we will publish a prose poem on the Savior and a poetic monologue from the devil’s point of view. We will publish essays about life on an island in Cape Verde, family complications caused by conversion, and serving in old age. We will publish a young adult romance, a story of despair and connection, a tale of tattoos, two stories involving time travel, a creation story, and an alternate history of the Restoration. As we sit around this campfire and truly listen to each other’s stories, we are better equipped to follow the Savior’s directive to love one another. So we hope you’ll join us for the coming two weeks for Around the World in Mormon Lit. We hope the stories will challenge and inspire you, that together we can hear a multitude of voices, and that we may be one. We also hope, when the two weeks are over, that you’ll take the time to vote for your favorites and to help recognize these writers from around the world. Stories will be published daily at 9 a.m. MDT. If you’d like to see daily updates on the contest, please visit our Facebook page. For a discussion of the entries, visit our open discussion on our Patreon. If you have a story, essay, or poem that would like to share, please consider submitting to the 8th Annual Mormon Lit Blitz by 31 May 2019. This contest and our other contests are made possible through the generosity of readers and writers. If you would like to support this and other Mormon Lit Blitz contests, please visit our Patreon. I would like to know how the people can vote? Can you help me to know about it? Voting will be available on this website from April 29th until May 4th. Winners will be announced the following week.